When she moved her young family to her husband's hometown in northern France, Karen Le Billon expected some cultural adjustment. But she didn't expect to be lectured for slipping her fussing toddler a snack, or to be forbidden from packing her older daughter a school lunch. 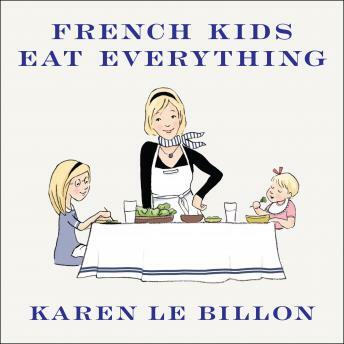 Karen is intrigued by the fact that French children happily eat everything-from beets to broccoli, from salad to spinach-while French obesity rates are a fraction of what they are in North America. Karen soon begins to see the wisdom in the 'food rules' that the French use to foster healthy eating habits and good manners in babies and children. Some of the rules call into question both our eating habits and our parenting styles. Other rules evoke commonsense habits that we used to share but have somehow forgotten. Combining personal anecdotes with practical tips and appetizing recipes, French Kids Eat Everything is a humorous, provocative look at families, food, and children that is filled with inspiration and advice that every parent can use.